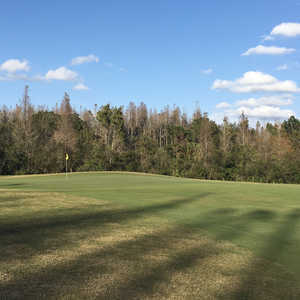 TAMPA, Fla. -- At Heritage Isles Golf & Country Club, it's all about the greens. It's not that the rest of the course can't be brutal, but the greens are what everyone talks about when it comes to Heritage Isles. 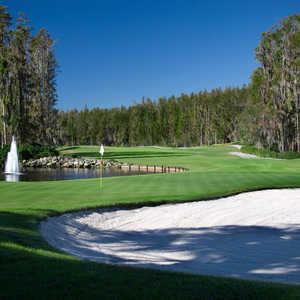 The greens are what everyone talks about when it comes to Tampa's Heritage Isles Golf & Country Club. "Our greens are in incredible shape," Director of Golf Robert Cunningham said. "They are tough but fair, and they are in great shape." Heritage Isles is tight and long at 6,976 from the tips. Water comes into play on nearly every hole and it isn't just an illustration on the scorecard. The water here actually does come into play on almost every approach shot, which makes it tough when the pins are placed anywhere but in the middle of the green. "The course is in great shape and it is only getting better," Cunningham said. "We are making everything better and this is one of the prizes in all of Tampa." The course begins with an easy 346-yard par 4, but it starts to bite on the 553-yard second hole. It's a par 5 with a severe dogleg left off the tee. If you hit it too far, you are going to be wet, right into the pond at the corner. The green is surrounded by bunkers and backed by water on the back left. Stay away from the driver off the tee and lay up on the approach. There's just too much to mess with around the green. And the golf course, designed by Jed Azinger and Gordon Lewis, doesn't get much easier. The third hole is a 430-yard par 4 that has a carry over water off the tee. There is also an iconic oak tree that has been on the property for more than 100 years. It can be a problem if the tee shot goes left. The club had permission to have the tree removed, but Azinger said he wanted it to stay and later said it was one of the favorite holes he has ever created. Most of the holes at Heritage Isles have carries over marsh from the tee, so the trick is to carry the marsh and water, but setting up a second shot without getting into trouble on the fairway when the doglegs come into play. Hitting the targets is everything, but it requires thinking two shots in advance and having an idea of what awaits on the approach shot. There are no GPS systems in the golf carts, so do all the homework you can before teeing off. Cypress groves and wetlands are everywhere, so if you stay dry, you can still find yourself in the woods. Staying straight is vital, even if it means sacrificing some distance off the tee. Right from the beginning of the course, you'll also have to watch out for the par 3s, some of the most demanding holes on the course, particularly from the back tees because of their length. The shortest and perhaps the easiest of them is No. 5 (199 yards from the back tees and 130 from the forward). All the rest are more than 200 yards from the tips. No. 7 is a 558-yard par 5 that is the signature hole at Heritage Isles. It contains wetlands on both sides and there is a severe dogleg left to the green. You can go for it, but it's a long carry over water to reach it in two. Heritage Isles Golf & Country Club's back nine is a little easier, but there's still the wetlands and water to deal with. No. 11 is the No. 1 handicap home on the course. At 563 yards, it is the longest hole on the course, and, although the signature doglegs aren't there, it is long and there is water everywhere with a pot bunker on the right of the green. The closing hole is a par 4 that is 399 yards with a sharp dogleg right with wetlands on the left side and a lake on the right. This is another fairway that offers the chance to try to cut the dogleg. Heritage Isles is one of the more popular golf courses in the Tampa Bay area, but it is worth the trip. It is close to the Tampa International Airport, as are many of Tampa's better-known courses. It is tough, but fair, and that counts a lot in the competitive Tampa Bay golf scene. "If you don't try to bomb it off the tee and plan your next shot in advance, you can go low," Tampa-area golfer Heather Jakle said. "I don't hit it far, but I hit it smart and that's how to play this course. It's a great course and they treat you right." Heritage Isles Golf & Country Club's greens are in great shape. Just ask anyone at the course. It is conveniently located and plays fair from the tips and the much shorter red tees. 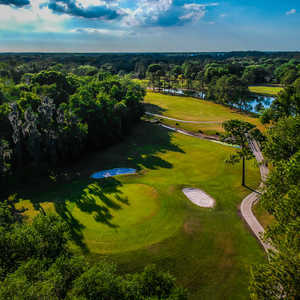 It's one of the must-play courses in the Tampa Bay area.